After a heavy workload, Josh Hazlewood will miss the opening game of Australia's ODI series against Pakistan. Australia paceman Josh Hazlewood will be rested for the first one-day international against Pakistan on Friday. Hazlewood, who celebrated his 26th birthday on Sunday, starred in Test series against South Africa and Pakistan and the ODIs with New Zealand. He will miss the opening game of the five-match series against Pakistan, Australia head coach Darren Lehmann said on Sunday. "Josh has got through a heavy workload during the home summer so far and in the past two months he has sent down almost 300 overs across two Test series against South Africa and Pakistan, as well as three ODIs against New Zealand," he said. "He's not injured but we have decided to give him a week to freshen up at home and he will link up with the ODI squad in Melbourne ahead of the second match of the series. "Although, if one of our other fast bowlers picks up an injury in the run-up to Friday's first game at the Gabba then he could be called up to slot in." 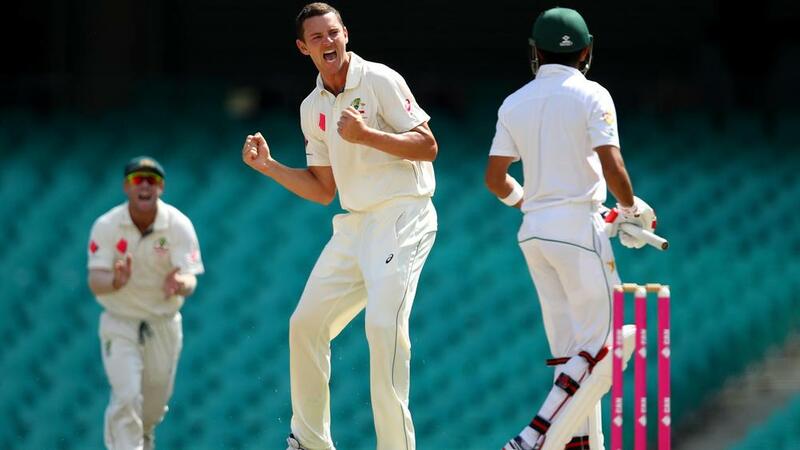 Hazlewood was the leading wicket-taker in both of Australia's Test series, picking up 17 against South Africa and 15 in the triumph over Pakistan. He also took six wickets in the ODI series against New Zealand.